The Aberdeen players attracted praise from manager Derek McInnes for dusting themselves down after Thursday's Europa League defeat to beat Kilmarnock 2-0. The Dons drew 1-1 with the Kazakhstan side Kairat Almaty at Pittodrie but were knocked out 3-2 on aggregate. "It says a lot about the players that they have managed to pick up from the disappointment and see the importance of this game," said McInnes. "I thought it was a top-class performance. We were very dominant." 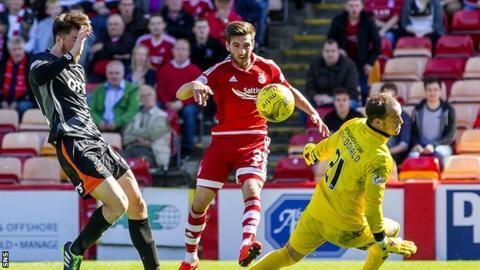 The win, secured by a strike from summer signing Graeme Shinnie and an Adam Rooney penalty, means Aberdeen join Celtic and Hearts on six points at the top of the Scottish Premiership. "We took the initiative and imposed ourselves on the game and created umpteen chances," McInnes told BBC Scotland. "Naturally, for the last 15-20 minutes of the game some players were running on empty, but when you've got that 2-0 cushion you can be excused. "For 70 minutes there was a lot to like about the team. "It was a strong, dominant performance against a team that came to sit in and try to hit us on the counter attack. "I'd have taken a 2-0 victory before the game, six points out of six, two clean sheets in the league, on the back of two very demanding European games. The players have earned a couple of days off. "We'll get them ready to set about Motherwell on Saturday." Last season the Dons accumulated 75 points, their greatest ever points haul, and the manager is determined to raise the bar higher still. "The challenge is to get that momentum and keep winning games and keep that demand on ourselves to improve," he explained. "I believe this squad is better than last season's squad. It's tighter in numbers but hopefully we can cope with the demands." For Kilmarnock manager Gary Locke, the performance was an improvement on the 4-0 loss at home to Dundee on the opening day of the campaign. "We got a response," he said. "We were certainly more aggressive and didn't lose as many tackles as last week. "We were terrible last week. The boys showed a lot more fighting qualities today. "We had to make sure we were a bit more solid because we had lost too many goals last week. "We need to create more in the final third. "In the first half we didn't get forward as much when we had the chance to counter attack, to get to Kris [Boyd], which we had worked on, with Rory [McKenzie] and Higgy [Kallum Higginbotham] getting in touch with him. "We did that better in the second half. "I thought the game plan was working fine and then we lost a scrappy goal just before half-time. "I thought Greg [Kiltie] came on and did very well, just playing in behind Kris, and got forward very well and looked very sharp. "He will certainly be in the reckoning for Wednesday night [against Celtic] because he made a big difference to us. "It's a tough game and it's one we have to try to win. We have to make sure we get our first win of the season as quickly as possibly."